On the heels of last week's "Behind Enemy Lines" comes another film set during the Bosnian War. However, instead of being a rousing and technically-sophisticated gung-ho Hollywood actioner, "No Man's Land" offers a Bosnian perspective on the conflict, brimming with absurdity, cynicism, and uncompromising tragedy. Indeed, the director of "No Man's Land", Danis Tanovic, began his filmmaking career capturing war footage for the Bosnian army, and witnessed firsthand the events that he ruthlessly satirizes in the film. 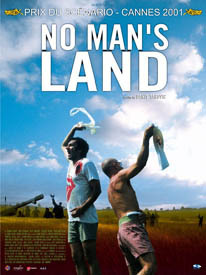 And thanks to some well-deserved buzz at the 2001 Cannes Film Festival (where Tanovic also picked up a screenwriting award), "No Man's Land" has finally arrived stateside with a limited release. ... which does as both sides call on the United Nations to defuse the situation. 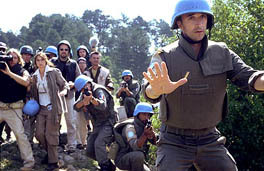 A small squad of UNPROFOR soldiers arrive (who are mockingly referred to as 'Smurfs' because of their bright blue helmets), led by Sergeant Marchand (Georges Siatidis). Unfortunately, Marchand finds his hands tied by his protocol-obsessed commanding officer (Serge-Henri Valcke) and the overly-politically-conscious head of UNPROFOR, General Soft (Simon Callow of "Shakespeare in Love"). But thanks to the snooping of reporter Jane Livingstone (Katrin Cartlidge of "Before the Rain"), resolving the plight of the three men caught between the front lines becomes a top priority for the UN, resulting in an entourage of UN soldiers and reporters descending on the trench. Unfortunately, the involvement of the international community and media end up making the situation far worse. "No Man's Land" shares similar qualities to many of the Balkan films that have gained international recognition in the past few years. Like "Cabaret Balkan (Bure baruta)", "Underground (Bila jednom jedna zemlja)" and "Marsal", "No Man's Land" presents a microcosm of the Bosnian conflict in the plight of its three trapped soldiers and the unsuccessful intervention of its would-be international saviors. And like "Pretty Village, Pretty Flame (Lepa sela lepo gore)", Tanovic highlights the absurdity of the situation with plenty of gallows humor, such as how control jumps between the three soldiers as AK-47s change hands, or how Marchand unsuccessfully tries to find somebody who is able to speak French (the language of the UN peacekeepers). Unfortunately, as in the real Bosnian conflict, such absurdity inevitably gives way to tragedy by way of self-interest-- the United Nations find themselves ill-equipped (both technically and politically) to resolve the predicament, the media is too image-savvy to uncover the reality of the situation, and the three men at the center of attention end up being sacrificed in the name of expediting the peace process. "No Man's Land" may lack the visually-arresting cinematography or crackerjack action sequences of "Behind Enemy Lines", but it offers some compelling insight into the complexity of the conflicts that arose out of the ashes of the former Yugoslavia. 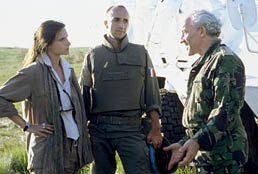 In addition, the film illustrates how the lack of political will on the part of the international community (particularly the United Nations) condemned the people of Bosnia, Croatia, and 'rump' Yugoslavia to six years of bloody war from which emerged many 'losers' and few 'winners'. 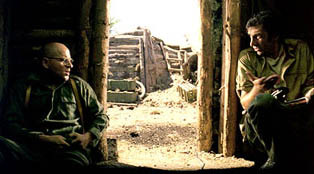 Indeed, "No Man's Land" is a war film about a war that few in the West understood, let alone cared about, yet offers several some timely caveats for the difficult road ahead in Afghanistan, in the aftermath of the Taliban government's collapse. Images courtesy of United Artists. All rights reserved.